How do artists reflect on our fast changing, technology driven society? During the group exhibition Salon VI we will investigate ‘Innovatism’. In4Art coined this term to highlight works of art that are based on technological experiments or material research. We will deep dive into the quantified self-movement and data visualization in art works. Which data is available, who can access it and what can you measure and do yourself? Once you selected the data, there are amplified possibilities of how to interpret or relate to it. One way to do so is through Artificial Intelligence. In the work Spotlight Constant Dullaart uses Deep Neural Network algorithms and questions the future of labour. In Neural City, Jasper van Loenen pushes the boundaries of city planning by training the network to interpret the data from Google Street View. Technological possibilities in this field are growing exponential, leading to new possibilities. But, ultimately, also make us question whereto will it evolve? Harm van den Dorpel discusses with his work Astena Astena Zapadlo the ‘designer baby’ challenge through evolution theory and natural selection, but then digitally. Having the code, the hardware and the open source knowledge availability provides an experimentation ground that literally gives the possibilities of large university or industrial laboratories into the hands of individuals. If everything is evolving and designed faster and we can direct data and material transformation to our wishes, we start to touch upon ethics related to issues like transhumanism. As a consequence of this exponential growth, technologies will also become quickly outdated. Who nowadays still uses a cassette or CD-ROM? The work of Daniel Canogar brings us back to reanimating the lifeless by reviving a collective portrait of secrets contained in discarded electronic materials. Art history has been characterized with many ‘-isms’, from impressionism, expressionism and futurism to surrealism and classism. New mediums are being explored; 3D printing, VR, Interactive Art, Bio Art, etc. We like to relate to art within a certain scope. Now a days, the boundaries have faded. Therefore, there is a need to have a framework. ‘Innovatism’ is linked to the radical observations and artistic prototypes of artists, showing their relevance and research endeavours to society. 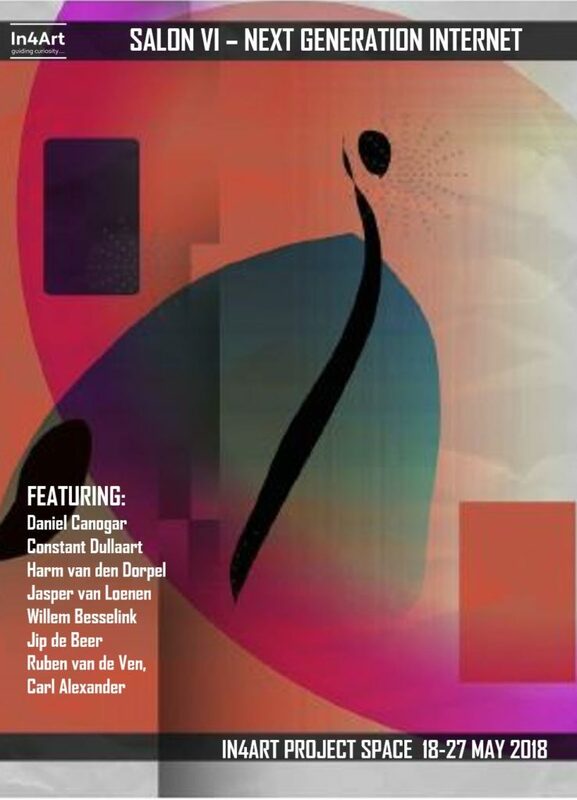 In this group exhibition works from the following artists will be exhibited: Daniel Canogar, Constant Dullaart, Harm van den Dorpel, Willem Besselink, Jasper van Loenen, Carl Alexander, Ruben van de Ven and Jip de Beer. Salon VI shows a selection from the In4Art Collection and will be publicly shown for the first time in Amsterdam. Independently, the works have previously been showed at expositions /shows in Berlin, Madrid, Freiburg, Rotterdam and Arnhem. All works are a conversation starter to explore (societal) developments and offer a breeding ground for scenarios. They all have a link to Next Generation Internet. Part of the Salon format are the Sunday Afternoon Conversations. The Sunday afternoon conversations will take place on Sunday May 20th from 15.00 – 17.00 and Sunday May 27th between 15.00 – 17.00 and are free to join . The theme of the conversation is radical observations & artistic prototypes in the field of IoT. Our ever more connected society carried by IoT platforms is on the verge of a transformation. Each change, leads to new perspectives and scenarios that could influence your daily practice. Therefore, it is important to benefit from radical observations & artistic prototypes. These show glimpses of progressive futures and might have transformative potential. During this conversation you will receive a crash course on radical observations and artistic prototypes in the field of IoT, which will provide inspiration and input for your innovation activities. The Salon took place from May 18th – 27th. Read the catalogue here and get an overview of the exhibition. For further reading on data artists, read ‘From Paint to Pixels‘.